Research on cell upgrades and 3D printed tissues means more people may live to 120. Scientists are increasingly approaching ageing as a disease that can be understood and treated so that we can live far longer, and healthier, lives in the future. “I think definitely the prospect of living to 120 in good health – that is more and more likely,” says Luke O’Neill, professor of biochemistry at Trinity College Dublin. We are living longer, certainly, with the average Irish man now living to 78.3 years and average Irish woman reaching 82.7 years, according to the Central Statistics Office (CSO). That is an increase of 20.9 years for men and 24.8 years for women since the first official table on Irish life expectancy was produced in 1926. 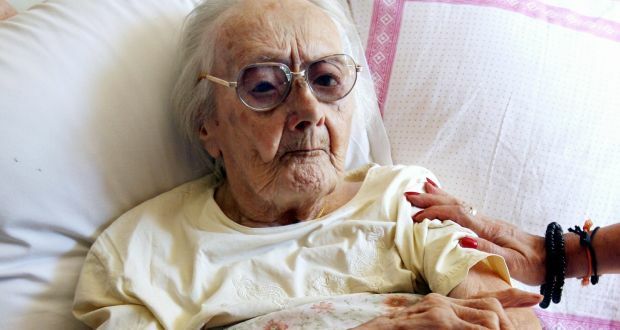 Many scientists believe human longevity will hit a wall somewhere around 120 years, while a smaller number believe lifespan can increase indefinitely. What is probably more important is the number of healthy years we can live. The figures here are less impressive. According to an EU healthy-life measure, health in Ireland begins to deteriorate on average at 66 for men and 67 among women. For scientists therefore, the name of the game is first and foremost to try and increase the number of years that people can live healthy, active lives. And there are a number of scientific strategies and approaches to try and tackle the “problem of ageing”, with Irish researchers leading the charge. Danny Kelly is a professor at the school of engineering in Trinity. He was awarded a prestigious grant from the European Research Council in September to develop new treatments for osteoarthritis. Osteoarthritis is a disease of the joints caused by the breakdown of cartilage and bone tissue inside the joint, and leads to pain and loss of joint function . It affects an estimated 45,000 people in Ireland. The treatment at the moment is to replace diseased hips or knees with metal and plastic (polymer) implants. Kelly is aiming to develop a way of using 3D “bioprinting” technology to print a biological implant that will regenerate and replace damaged tissues in a diseased joint. The metal-plastic implants used in diseased joints today last for between 10 and 15 years, and result in reduced pain and increased joint function for the patient. For people under 70 with diseased joints, the likelihood is that they will need to replace their implants.